There’s a revolution afoot, a huge shift in how business is conducted. Old means of reaching out to potential customers and encouraging growth can no longer compete with online marketing and research tools. Purchasers of professional services now spend less time and invest fewer resources researching service providers. There’s less need for lengthy RFPs – a potential buyer can spend a morning instead of a month narrowing the field. But what kinds of tools are we talking about here? And how can they impact my professional services firm? For starters, buyers are, without a doubt, searching online for services you offer. If you’re not making yourself visible, you’re missing out. Second, your competitors are likely online. If you aren’t—and if you’re not utilizing all of the web analytics tools at your disposal—then you simply can’t compete. Why are web analytics tools so important for growth? We’ll get to that. But first, let’s take a look at some key differences in the priorities of high growth firms and their average growth counterparts. The following data is based on a survey of 500 firms. 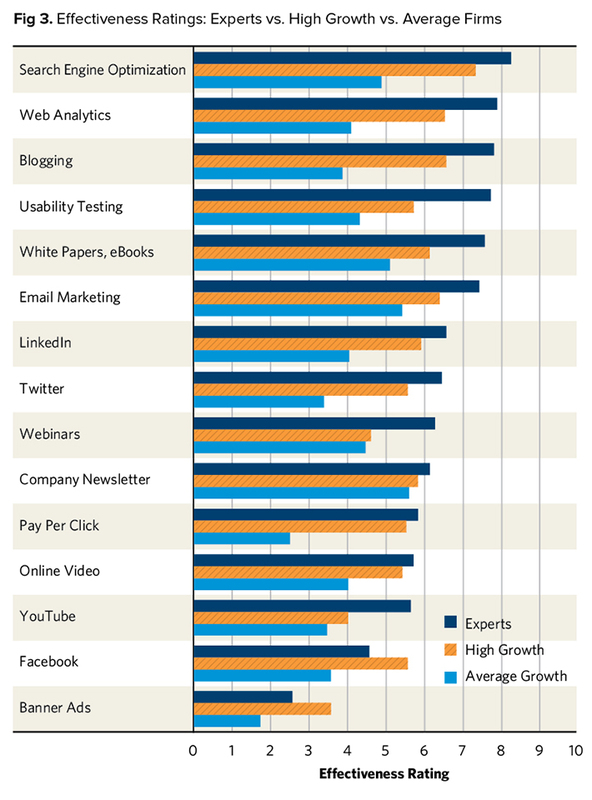 Across the board, high growth firms place more focus on online tools. The biggest gaps between high growth and average firms are the use of web analytics tools and pay-per-click (PPC) advertising. Web analytics tools are particularly important to marketing campaigns. Why? Because they reveal the efficacy of your efforts and uncover patterns in potential clients’ online behavior that can inform how you use all of the other tools at your disposal. We’ll get into those specifics momentarily. But lets look first at the effectiveness of online marketing tools. 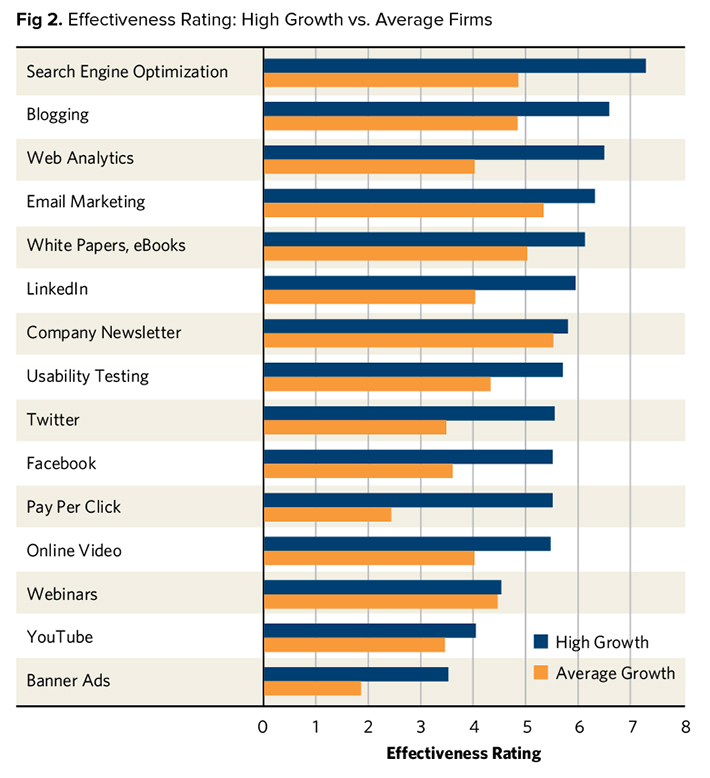 It’s no coincidence that high growth firms, who do more with online tools, see more results. Greater focus on a particular tool results in greater effectiveness. 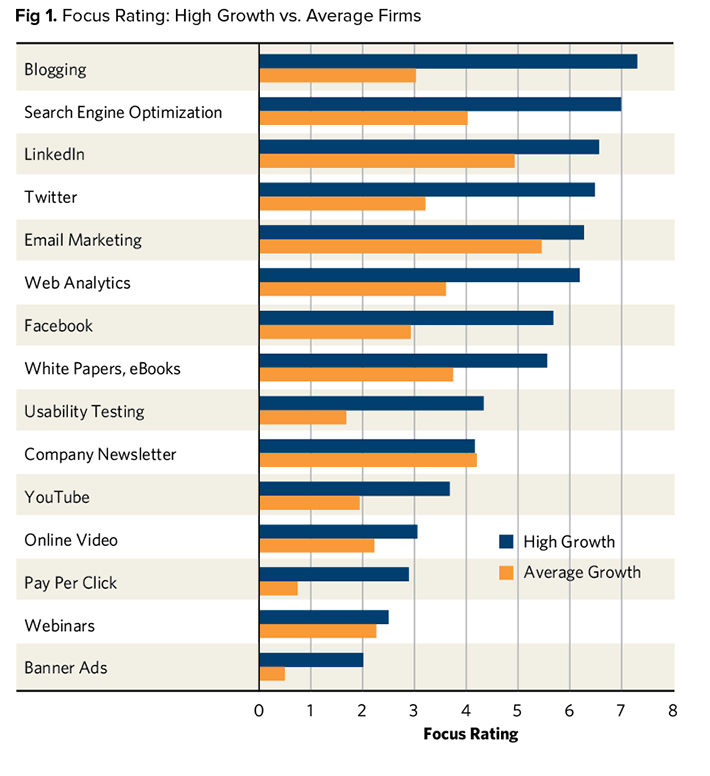 The conclusion is inevitably drawn: greater online focus = greater effectiveness of those tools = higher growth. And expert users experience even greater impact from these tools. Notice that our aforementioned web analytics tools ranks in the top three of both above effectiveness measures. This is for good reason. In short, web analytics allow you to track a variety of metrics to give insight into your target audiences. Uncover the activity on your website—visits, downloads, traffic sources, and form fills. Analytics is key in understanding traffic sources, as well as conversions, visitor interaction, and marketing effectiveness over time. Such valuable information might seem a costly investment, but it’s far from it. You can download Google Analytics (the most popular analytics software in the world) for free. Once you’ve done that, start with the basics—uncover the number of unique visitors, most viewed content, and so forth. From there, get a little more complex; pick some goals and track them (like, how many visitors are filling out contact forms or subscribing to a newsletter, blog, or other media channel). In short, see if your SEO and other marketing strategies are working. We’d be remiss if we didn’t touch on search engine optimization (SEO). Sometimes called organic search, this is the process of attracting traffic to your site. In a nutshell, users are driven to your site when you have content relevant to their searches. There are technical means of tweaking your site for greater results as well, and determining keywords that users are likely to employ in their searches is a big part of a successful SEO strategy. When you are ranked for relevant terms in your field, you’re more likely to attract the kinds of clients who are most interested in your services. Effective SEO can take some time to organically yield results (a few months, give or take), so the sooner you start generating quality, relevant content, the sooner you’ll see an increase in traffic. You’ll recall that pay-per-click (PPC) showed, along with web analytics tools, the greatest variation between high growth and average growth firms. In other words, these two methods can, in theory, make the greatest difference in your firm’s growth. PPC is the placement of advertisements in the sidebars of user searches. You pay a fee each time an ad is clicked. It can be effective for generating quick results for keywords that you haven’t yet successfully integrated into your SEO strategy, but shouldn’t be considered a replacement for organic search. Your goal should be to have content that actually draws in potential users. In the end, you can’t game the system—at least not for long—your target audiences will either find your content (and the services they describe) valuable, or they won’t. No amount of tampering with search results can change that. But knowing what content on your site is getting the most hits will help you understand what prospects find valuable. Knowing where those users are coming from, how often, and by what means, will help you optimize the experience of your most interested audience. Remember, the experts and the high growth firms agree! Web analytics ranks high on their list of online tool effectiveness—just below SEO (which is what analytics are designed to serve). The research bears out that effective use of online tools yields higher growth and expertise in using these tools results in greater effectiveness. Experts will be able to employ these tools to the greatest benefit. That’s not to say that you won’t see results from your own web analytics and other efforts. But once you’ve mastered the basics and joined the high growth category, it’s well worth the investment to employ the services of experts to push your web tools’ performance to their fullest potential. About the Author: Katie Sanner is an Associate Account Director at Hinge. At Hinge, Katie is able to consistently assist her clients in brand building, improve their brand strength, and increase marketability. Katie is an active member of the Society of Marketing Professional Services where she currently sits on the DC Chapter’s Board of Directors. Wonderful case study mate, I must say analytic tools are very effective to tracks the performance of the website and we can also improve the results by working hard on it. Great article – Understanding your data can only strengthen your business – Where your customers are coming from, how effective a your marketing efforts are, whether your email list is actually purchasing (doing more than just clicking through to your website) all of this and so much more is available in your analytics. Analytics is so really important for any business wants to expand and grow. And Google Analytics in this case does a great job as a free tool.